I just tried out this wireless bicycle computer from MeasuPro and I love it. It’s really simple to install and comes with everything you need. There is a sensor that you install on the spokes of the bicycle to read information on the speed and distance, etc. Then there is a computer you can install on the handle bars. It is adjustable to it all fits any bicycle. The computer is really neat it gives you information about how fast your going, distance from the sensor you install on the bike wheels and it also has information about your personal health stats from the heart rate monitor you wear (also included). The heart rate monitor is a really neat feature you just wear it around your chest and it relays information to the computer display about your heart rate. This is a great feature, if you know what your optimum heart rate is when you are working out this tool really helps you to stay within your heart rate so you burn better and faster. It’s also just great information to have when you are working out. It’s easy to use and install. The materials are well made and work well. I just got this great digital blood pressure monitor from Measupro. I have had high blood pressure for a couple of years now so being able to monitor at home is really important to me. If I feel like it is high I want a quick easy way that I can measure it. However, I’m not a doctor or nurse and I have not idea how to you a blood pressure cuff. That’s where this blood pressure monitor from Measupro comes in handy. Just slide the cuff on your arm. Press the power button and it starts to work instantly. It tells you your blood pressure and your pulse. I also love that it gives you the option to store your readings (up to 60) so you can monitor your readings over a period of time. It also has setting to set up two different users. So now me and my husband can both monitor our blood pressure. This monitor is really unique in that it also gives you an idea of how high your blood pressure is by using color displays if it’s to high it will display red, if it’s in the mid high range it’s yellow, and normal is green. I love that because sometimes I don’t really know what numbers are good or bad. It works really well and is really accurate too. MeasuPro helps keep you focused on your health by providing you with the tools you need. Using advanced technology, the MeasuPro Digital Upper Arm Blood Pressure Monitor provides accurate measurements of your blood pressure and pulse rate. Measurements are taken through an automatic, fast and easy process using Measure and Inflate technology. The pressurized arm cuff auto-inflates with the touch of a button and automatically releases the pressure when the measurement is complete. 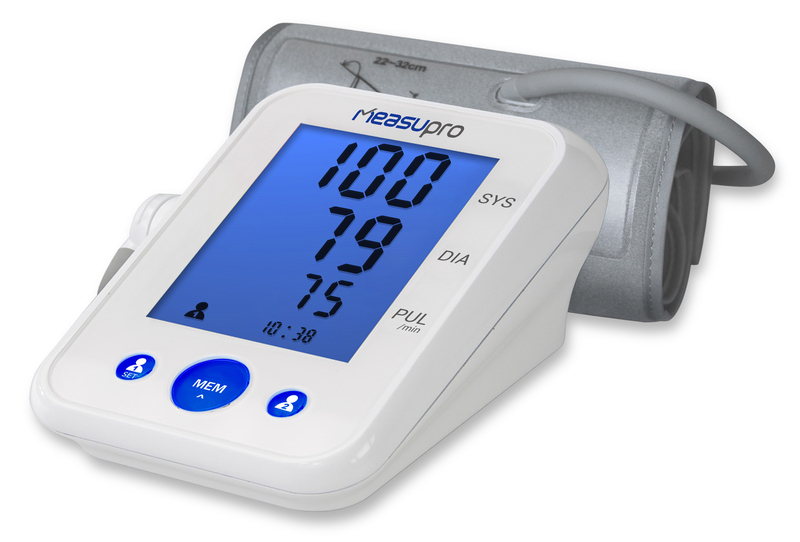 This MeasuPro Digital Upper Arm Blood Pressure Monitor features a bright LCD display with separate touch buttons for each individual user. It features a unique desktop design so you can easily store this device in your home or office. The BPM80A records up to 120 blood pressure readings, 60 readings per user, with date and time memory recall. Graphical readings are classified in five different levels and color coded to represent the reading’s level of hypertension. It also calculates and averages your blood pressure based on the last 3 readings and detects irregular heartbeats and any arrhythmias. Arm cuff fits upper arm circumference of 23-32 cm. The MeasuPro blood pressure monitor ships with 4 AAA batteries (included), medium to large sized arm cuff, carrying bag, and user manual. 2 year manufacturer’s warranty included. You Can purchase this blood pressure monitor on Amazon! 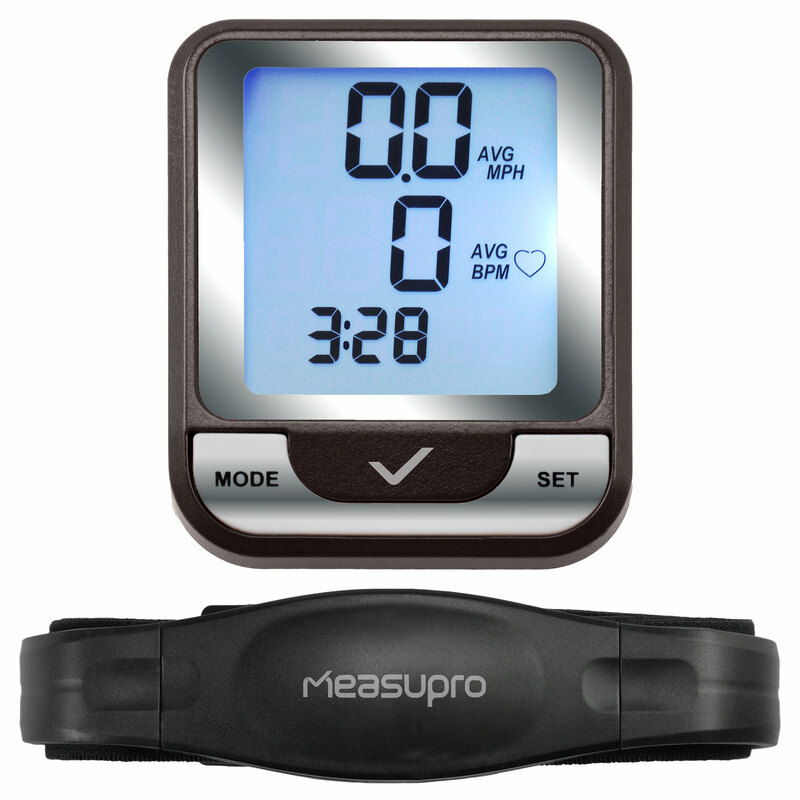 I just got this great digital wrist blood pressure monitor from Measupro. I have had high blood pressure for a couple of years now so being able to monitor at home is really important to me. If I feel like it is high I want a quick easy way that I can measure it. However, I’m not a doctor or nurse and I have no idea how to use a blood pressure cuff. That’s where this blood pressure monitor from Measupro comes in handy. Just slide the cuff on your wrist. Press the power button and it starts to work instantly. It tells you your blood pressure and your pulse. I also love that it gives you the option to store your readings (up to 60) so you can monitor your readings over a period of time. It also has setting to set up two different users. So now me and my husband can both monitor our blood pressure. It works really well and is really accurate too. I just got this great digital blood pressure monitor from Measupro. I have had high blood pressure for a couple of years now so being able to monitor at home is really important to me. If I feel like it is high I want a quick easy way that I can measure it. However, I’m not a doctor or nurse and I have not idea how to you a blood pressure cuff. That’s where this blood pressure monitor from Measupro comes in handy. Just slide the cuff on your arm. Press the power button and it starts to work instantly. It tells you your blood pressure and your pulse. I also love that it gives you the option to store your readings (up to 60) so you can monitor your readings over a period of time. It also has setting to set up two different users. So now me and my husband can both monitor our blood pressure. It works really well and is really accurate too. MeasuPro is tuned into your needs while monitoring your health on a regular basis. Using advanced technology, the MeasuPro Digital Upper Arm Blood Pressure Monitor provides accurate measurements of your blood pressure and pulse rate. You’ll find that it is compact, comfortable, and simple to use. Using a highly advanced mechanism, it offers state of the art technology to provide the highest grade accuracy. Measurements are taken through a fast and easy process using Measure and Inflate technology. The pressurized arm cuff auto-inflates with the touch of a button and automatically releases the pressure when the measurement is complete. 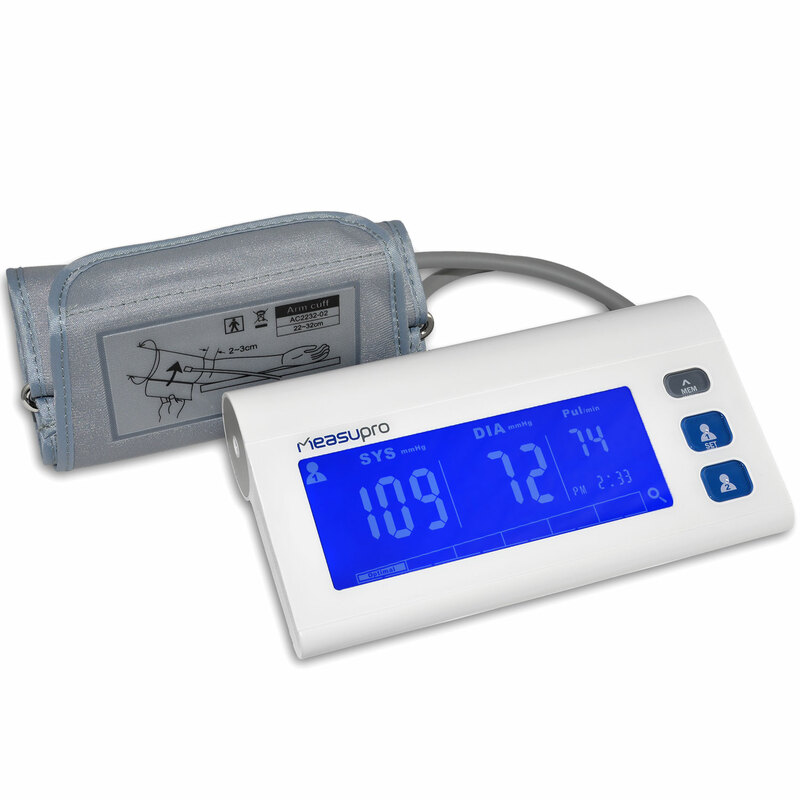 This MeasuPro Digital Upper Arm Blood Pressure Monitor features a bright LCD display with separate touch buttons for each individual user. The BPM80A records up to 120 blood pressure readings, 60 readings per user with date and time memory recall. Graphical readings are classified in five different levels according to the guidelines of the American Heart Association: Normal, Pre-hypertension, Hypertension Stage 1, Hypertension Stage 2, and Hypertensive crisis. It also calculates and averages your blood pressure based on the last 3 readings and detects irregular heartbeats and any arrhythmias. 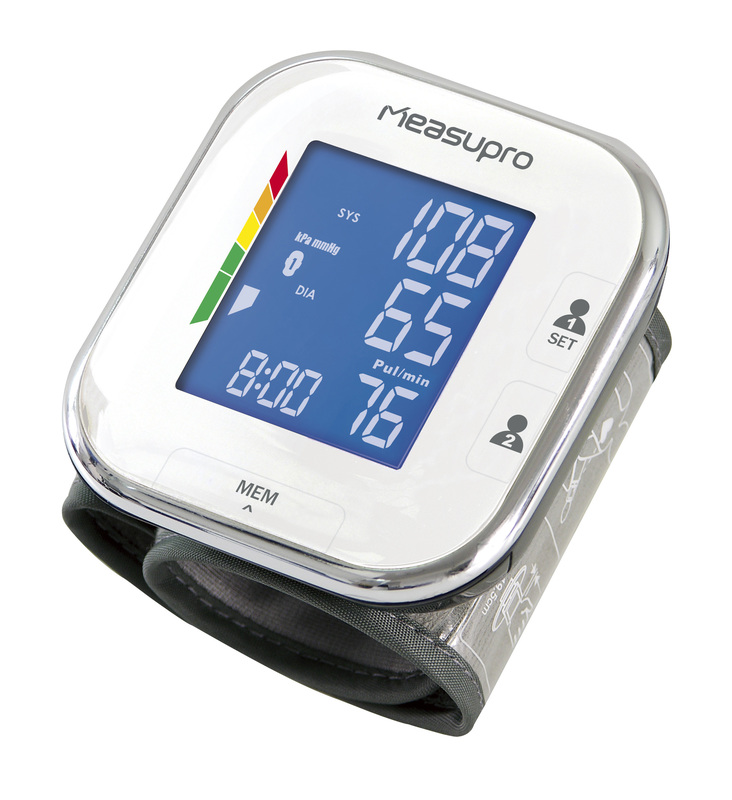 The MeasuPro blood pressure monitor ships with 4 AAA batteries (included), medium to large sized arm cuff, carrying bag, and user manual.